The small country of Belize has one foot firmly in the Central American jungle and the other in the Caribbean Sea. With national parks, wildlife sanctuaries and marine reserves, more than 40% of the country is protected in one way or another. As a result it has some superb fishing. In particular, it is known for mixed species fishing. Bonefish, tarpon and permit feature highly on the menu of many visiting fishermen and it is one of the great destinations to achieve a Grand Slam, catching a bonefish, tarpon and permit in one day. 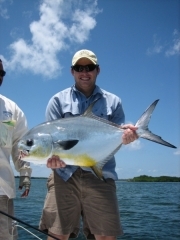 For permit specialists, the Turneffe atoll is a Mecca. Belize is also a great destination to combine a traditional beach holiday with fishing, diving and snorkeling.